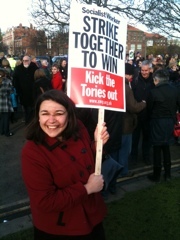 So, yesterday I joined thousands of public sector workers in a day of striking. I even decided to march. I shan't go into the whys and wherefores here. This isn't a political blog. I will point out though that for a person who was once a member of the Oxford University Conservative Association going on strike was a pretty serious and uncharacteristic thing to do. I will caveat that piece of information by saying that I became a member largely because they gave you free port and cheese on Sundays and champagne once a term. Needless to say, the quality varied. It also seemed a very glamorous and very "Oxford" thing to do which for some reason felt important. I didn't like the people mostly because they were careerist swine with the gift of the gab but lacking principle. This is a statement I can apply to most members of any Oxford student political party I came across. Anyway, my day of shouting and marching ended with a trip to my Local Fly Dressers Guild. I truly love going. It's a winter escape from it all. No one speaks of anything serious and a lot of me likes the fact that the whole atmosphere is one of little boys comparing their air-fix models. What matters most there is what you use for your wing-post. This sort of thing gives me perspective. Indeed fishing is what keeps me stable, solid and generally on an even keel. Fishing, my family and loved ones are what matters. So, on the whole, I am unbothered and don't have causes. Part of me had always worried about this. I wondered whether my general malaise, sense of bonhomie and my very British trait of not liking to make a fuss would have prevented me from joining the Suffragettes or say standing up to Hitler. Marching yesterday made me feel good. It reminded me that I do have some principles. Brilliantly and eloquently it taught me that somethings do matter more than fishing.